Water and electricity just don’t mix. Knowing that though might not stop us from using our mobile in the spa, or laptop in the bathtub or having a TV by the pool. We are just so addicted to our entertainment and connection to the world. Unlike the inconvenience of dropping your phone down the toilet or iPad in the Jacuzzi, having a TV by the pool is a much greater risk. It’s not just your device that can shutdown, it could be your heart. Your TV is connected to a main power source. When battery devices (phones, laptop, iPad etc) get wet, they short out and shut off, immediately. That means if you are in the water with them, you damage your device, possibly even to the point of no recovery, but you will be fine. The charge from the battery is just not strong enough to leave the device and enter the water or cause any serious damage (assuming your lithium battery behaves well and doesn’t explode). Connected to a power supply, however, it’s a very different story. Never use a plugged in item next to water. It doesn’t matter if it’s a hairdryer, computer or phone. Even though, technically, a plugged in phone should be able to handle a dunk without injury, you never want to take a risk with live energy, it’s just not worth it. While high-end products like Apple design their chargers to cut out when they come in contact with water a cheap charger, faulty charger or one that’s been around a while just can’t offer that guarantee. Especially if we are talking about big devices that use high volts of electricity around big bodies of water (like a TV by a swimming pool, outdoor spa or swim up bar). If these two should meet then the water, being a pretty decent conductor of electricity, will turn your pool into an electric chair. This is not a great look for you, your family, or any guests you might be entertaining. It wouldn’t take much to topple in really, TVs are not really designed to sit on the ground or on pool tiles. Running kids, clumsy dog or a gust of wind, and your TV would be cactus and your lawyer would be very busy. That doesn’t mean you should never have a TV by your pool, you can, we would actually encourage it. A poolside TV is a great idea. It looks amazing, gives you a sense of being a millionaire and is a great way to entertain guests. Just be sure that the TV you use for outdoor areas is fully watertight and firmly anchored to a feature wall or bracket. It is essential to be safe if you want the party to last. Think that’s a difficult task? Not at all. You can secure your TV easily and cost-effectively with a SealTV enclosure. It can be any flat screen TV, it doesn’t matter what brand, style or quality. A SealTV ready-made waterproof, weatherproof case will look amazing and give you the safety you need to bring a little bling to your outdoor area. All you need to do is measure your TV (see our blog on how to select the best size and space) and purchase the correct size enclosure. Choose if you want speakers and amp included in your outdoor entertainment package. After that you lock it in and bolt it where it will stand out and be seen. 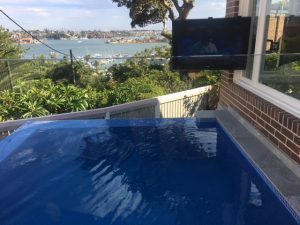 That’s really all there is to ensure you have an outdoor television that looks great and functions efficiently and safely by water. Not only is it safer, it looks the real deal. Unlike perching a standard TV on the edge of something, like a wall, a seat or the lip of the pool, which looks tacky and out of place, an enclosed and mounted TV looks like something straight from Cribs or a glossy money magazine. Your outdoor TV might be used for watching sport, cartoons for the kids, keeping up with your favourite TV series while you exercise or dinner and movies with friends. Any way you screen it, you look the part and stay safe. If you’d like more information about how you create a fully waterproof, weatherproof, fireproof, vandal proof and theft proof TV for your outdoor space contact us today. This entry was posted	on Sunday, February 11th, 2018 at 3:14 pm	and is filed under Blog. You can follow any responses to this entry through the RSS 2.0 feed. Both comments and pings are currently closed.